While we can’t speak for everyone in our family, we can commit to what everyone in our family should desire: We will serve the Lord! But more than commit, let’s set the example and lead the way. 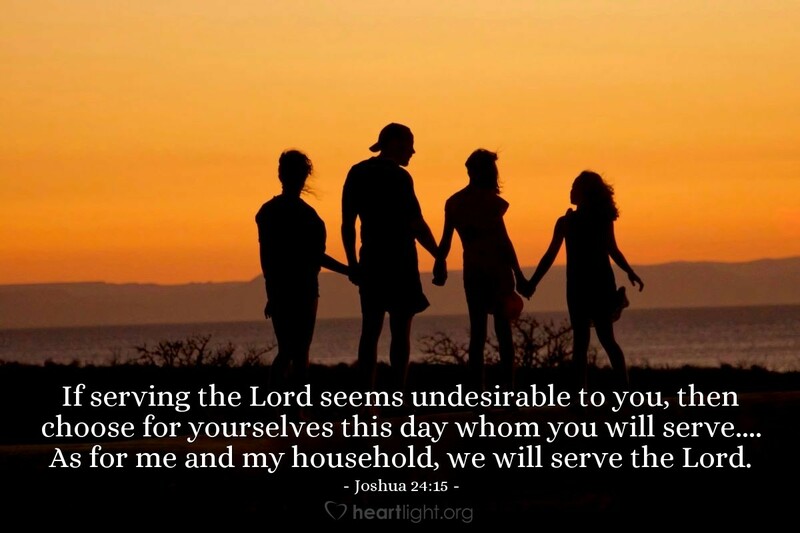 “I will serve the Lord, TODAY!” Then we can ask them to join us. Give me wisdom, O tender Shepherd, on how to lead my family to love you more. Please bless my parents and thank you for their faith. Please give me courage and sensitivity so that I can effectively share your truth with my children. O God, please bless those parents who are seeking to raise godly children that will someday marry the children you’ve given me. I want my house to be a place where you are known, appreciated, honored, and loved. In Jesus’ name I humbly ask it. Amen. Lord give us the grace to face the challenges we face in our daily lives and the humility to accept the blessings that come from your hands. We know all good things from from you to your hands. Bless the Lord all my soul and all that is within me bless your holy name.